Affiliate Disclosure: I am grateful to be of service and bring you content free of charge. In order to do this, please note that this post may contain affiliate links, when you click links and purchase items, in most (not all) cases I will receive a referral commission. Remember when we did Nana's Guest Bedroom? and then we moved her guest bedroom? Well you may be wondering what we did with the space that the original guest bedroom was in. If you are, today is your lucky day!! We turned the space into a Craft room for Nana. Nana really wanted a room that was super colorful and playful.... so that is exactly what we did. We started with a couple of Billy bookcases and a large Kallax shelf from Ikea. We went back to Ikea and bought a third Billy bookcase, a small Kallax shelf, a gray table, 2 drawer inserts, and large white and pink cardboard boxes. We stacked the Kallax shelves and used the Billy bookcases in the corners. This created tons on storage. This small gray table gives her extra work space and is easily moved against the wall, depending on her needs. To add interest to this blank wall we added a wall treatment and some wall paper and we hung one of Nana's favorite pictures. She also loved this frosted mirror, so we took it out of it's cheap plastic frame and attached it to the door leading to the bathroom. It not only looks pretty, but it reflects the light back into the room. 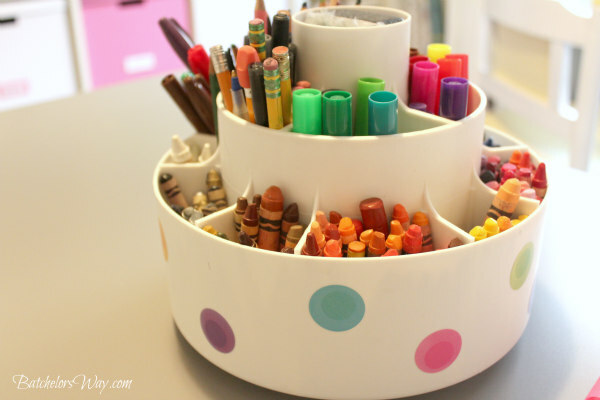 I love this spinning crayon and marker caddy that we found at a secondhand store. We cleaned it up and decorated it with colorful stickers that we bought at the Dollar Store. The colorful window shade is trimmed with the cutest blue trim and Giant Jumbo WHITE Pom Pom Fringe . We used bright colored totes from the dollar store to house different art supplies, like the one above. This one housed paints and paint brushes, it's simple to just pickup the tote and move it to where you want to use it and put it back. We added round wooden knobs to the drawers; each painted a bright color. 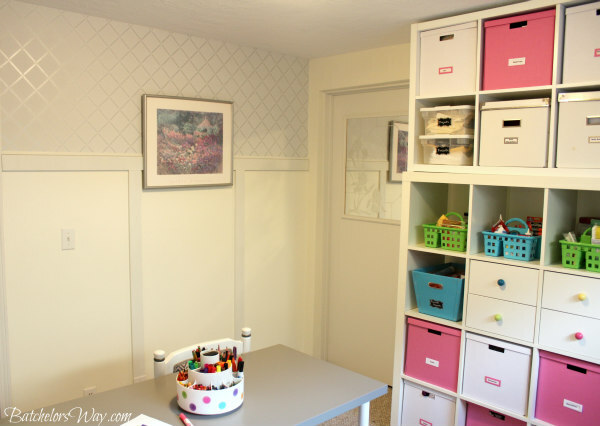 On the last wall we painted a giant frame bright pink and put white plastic Pegboard in it. It's a fun way to store/display more craft supplies like scissors. One of my favorite project for this room were the chairs. We found a set of four at a secondhand store for $8 for the set. They were ugly with faded dirty buff colored vinyl, but we painted the faded light oak chairs a crisp new white. 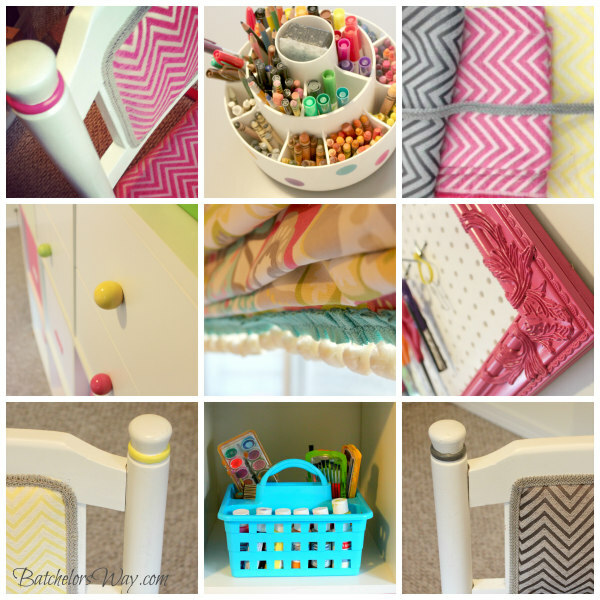 To add interest, we hand painted colored bands around the tops and bottoms of each leg, then we recovered the cushions with fun bright zig-zag material in grey, yellow, and pink. It was a super fun and easy project! The chairs are on wheels making them easy to move around the room. Function and beauty, my favorite combo!!! We found this used sewing machine cabinet and brightened it up with more beige paint. For the top we just gave it a good rub down with some oil. This gave her a large sewing top and more storage!! It turned into a super fun room to create in! Keeping with the fun feel of the room, we hung this photo collage above the pegboard. I hand painted the green stripe to make it really pop!! 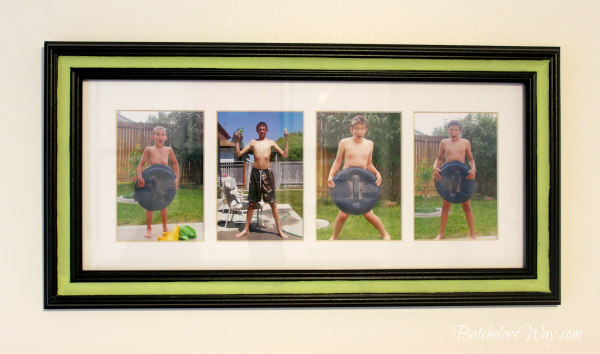 The photo's were a favorite memory of some of mine and my sister's boys. It was from one summer afternoon they spent playing in the sprinklers in Nana's backyard. 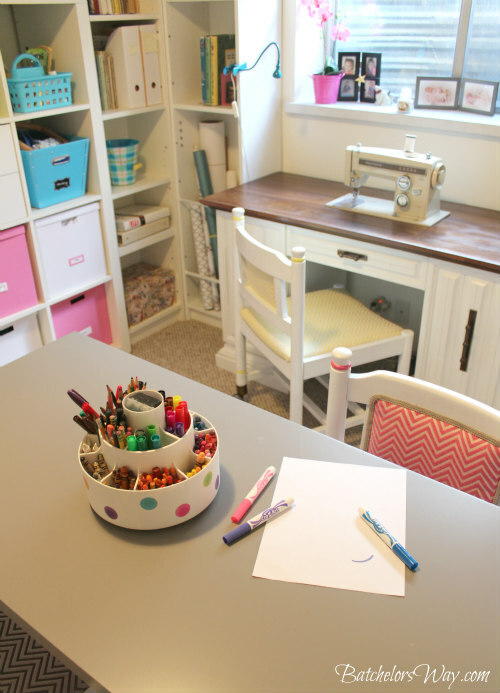 Hope you enjoyed this space and maybe found some inspiration for your craft room. Wow, I LOVE it! My favorite thing has to be those colorful chairs. 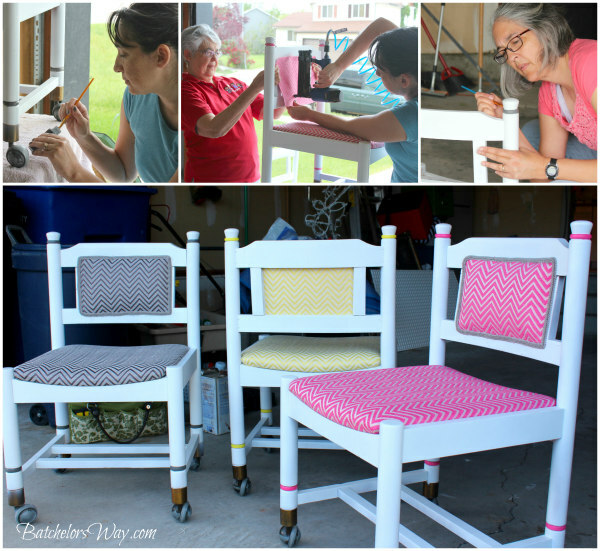 Love the fabric, and love that you painted a stripe at the top of each spindle. Such a fun unexpected pop of color! The chairs are very cute! That is A LOT of storage space! And I suppose it's absolutely necessary considering the amount of craft material you need to make up a fully functional craft space huh?